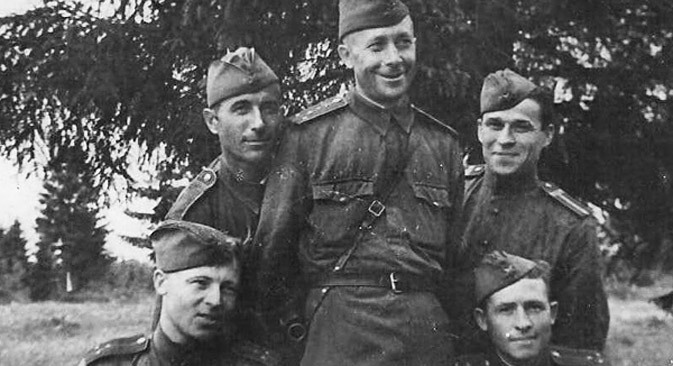 Thanks to a new online state initiative, families of Russian WWII combatants around the world are now able to give their forebears the recognition they deserve, 70 years on. The Zvyezdy Pobedy project, organized by the Rossiyskaya Gazeta newspaper, allows the descendants of those who fought in the Red Army in WWII to find out whether their ancestors were among the recipients of over 38 million orders and medals awarded during the war. Soviet schoolteacher Vasily Maslenkov managed to send 150 letters from the front, but he himself never returned home to his wife and daughter — he was killed in August 1943 at Smolensk (400 km west of Moscow). But in 2015, his daughter Tamara Maslenkova, a teacher just as her father had been, learned that he had been posthumously awarded the Order of the Patriotic War, 2nd Class. This discovery was made possible thanks to a special internet database called Zvyezdy Pobedy (“Stars of Victory”). The database, which is available only in Russian, is published on the website of the Rossiyskaya Gazeta newspaper with the support of the Russian Ministry of Defense. During the nearly four years in which the Soviet Union participated in World War II, soldiers of the Red Army were awarded over 38 million various orders and medals. Unfortunately, in many cases the award never reached the person who earned the honor. Now the families of veterans – and in some cases the veterans themselves – can check online see if there are any awards that belong to them. “My dear!” writes Vasily Maslenkov in one of the letters to his wife. “Soon it will be 11 months since we were separated. I remember that you and I did not want to be apart, not for a few days, not even for a few hours.” Now memories of him live on in his letters and pre-war photographs, cherished by his daughter Tamara. In the 70 years that have passed since the end of the war, its survivors and their descendants have been scattered all over the world. The goal of the Zvyezdy Pobedy internet project is to provide a way for these far-flung former Soviet citizens to receive their honors. There are more than 8,200 names listed in the database, which can be read in Russian at rg.ru/zvezdy_pobedy. With the help of readers, RBTH editors have already found the families of five women listed in the database. If you have Russian friends that live in your country, or you yourself are an émigré or a descendant, if your father, mother, grandfather, or grandmother fought in 1941-1945, please visit the website and check to see whether they were not among those who failed to have a well-deserved award delivered to them. RBTH will tell the stories of those veterans who are successfully found through the online database. Please contact us at info@rbth.com, if you have something to tell. Unfortunately, any honor or award issued during World War II can be legally given only to the person who actually won the award. If the person was killed or lost in the war, or has since died, the heirs of the person have the right to receive a certificate noting the honor won by their loved one upon presentation of the relevant documents. However, even if your loved one does not appear in this database, the 70th anniversary of Victory Day, the day the war in Europe ended – is a good occasion to remember the deeds of our ancestors, to offer congratulations to veterans of the Great Patriotic War and World War II all over the world, and help other families learn more about their heroes.